Does anyopne know where it is? The photographer is unknown. Note the Union Jack in the distance, just above the left-hand buffer. The location is Springs Branch, Wigan. The engine was renumbered to 25797 in 5/34, and the LNWR shedplate has been transferred to the smokebox door. Hence I would suggest that the date is 1934-5, before the new LMS shedcodes were introduced. The engine was a late survivor, being withdrawn in 6/47. From the arrangement of the shed roof - Ramsbottom on the left, Webb 'northlight' on the right - this looks like Springs Branch. If so, the main line is on the left, beyond the yard lamp. From the engine number the photo must have been taken in 1934 or later, and I'd guess 1934-39. As for the Union Jack, I have no idea what they could have been celebrating at Wigan that day. Maybe it was for the May 1937 Coronation? The union flag is surely to celebrate George V's Silver Jubilee on 6th May 1935, not the 1937 Coronation of Edward VIII. Philip must have a better computer than mine to recognise that the shedplate is the LNW enamel type. On my old screen it looks as if it could be the 1935 LMS cast-iron type, though unfortunately I can't read the number. Is it legible on the original print, I wonder? 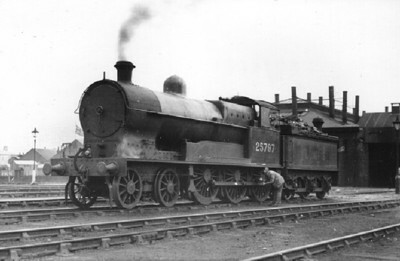 As the engine was renumbered 25797 in 1934, the date of the photo all depends on the shed plate. LNWR shed plates were transferred to smokebox doors before that and LMS cast plates were introduced early in 1935. The photo is not clear enough to be certain but it does not look like an LNWR plate to me, as the white enamel background usually shows through even on a very dirty plate. If it is an LMS plate, the date could be any time up to withdrawal in June 1947, so in addition to Harry's suggestions the Union Jack could be in celebration of the coronation of King George VI, or even of VE or VJ Day. The number 25797 is relatively fresh and in the condition one might expect if applied about twelve months previously. Compare the LMS on the tender. There seems to be a length of flagpole above the union flag and so the flag may not be at the top of the pole but at half mast. (A flag at half mast is two-thirds of the way up the pole, not half-way.) If this is so the most likely occasion would be the death of King George V which was in or about January 1936. By the way, Edward VIII was never crowned. George VI's coronation was held on the date originally arranged for Edward VIII. See comments by Ted Talbot in Mystery Photo No.73. I would stake a modest wager that the photographer is Leslie Hanson and the date close to 14th April 1935. Regarding mystery picture no. 67, despite what has been said it's not Springs Branch. I study that shed and there are a number of factors that eliminate it. Firstly there are not enough tracks to the left of the loco. If it was Springs Branch then there would be at least 18 tracks plus the yard sidings of Spring Branch North sidings. Secondly the building, again to the left of the loco, doesn�t/hasn�t existed at Springs Branch. Thirdly, the top section of the hip roof is wrong. If you look at the picture, the roof has a shallower louvre section than that of Springs Branch. We think it's Bolton shed. Look at P58 of Engine sheds Vol 3. I'm sure Chris Coates has given us the correct answer: it's the ex-L&Y shed at Bolton - No 26C. This is a bit of an embarrassment as it was my local shed and I knew it well (as a spotter) for 3 or 4 years from 1943. And only now do I see that the water-column behind 25797's tender is the L&Y type rather than LNW. I certainly never saw a Prince of Wales there, and never heard about any such exotic visitor, so feel pretty sure the photo was taken before WW2. The buildings on the left, just across the Bolton-Manchester line, were a wagon works in the 1930s. As to the flag, maybe it was for Wakes Week (in June, in Bolton) or Ernie Entwistle's lass getting herself wed. Or, happen, Bolton Wanderers winning something. This photograph appears in the book Railways in and Around Bolton An Historical Review by Bill Simpson. It is credited to the A.G. Ellis collection. The caption states that it was taken at Bolton (L&Y) MPD on May 12th 1935. Four engines of the class apparently came to Bolton in the mid 1930s to work local suburban services. May 12th 1935 was the Sunday following the celebration of George V's Silver Jubilee on Monday 6th May, so I guess that accounts for the flag.